Few trees are as majestic as the mighty oak. They can live to be 100 years old or more, reach a height of more than 100 feet, and have a top spread that exceeds 100 feet as well. Although they grow slowly, planting an oak tree in your yard is a great project for adults and children alike, and it instills a sense of passing on an heirloom for generations to come. Gathering, preparing and planting acorns to grow your own oak tree requires following a few basic steps. Gather your acorns from underneath an oak tree. It is best not to pull them from the tree, as they are not mature if they have not dropped yet. If you want acorns from the tree that have not been exposed to ground pests, shake a tree branch and the ones that are ripe will easily fall. The best time to gather acorns is when most of them have fallen from the tree in the fall, and always gather more than you wish to plant, just in case some are not viable seed when you test them. Remove any acorn caps by gently twisting them off the acorn. If the caps do not come off easily, the acorn is not mature enough to plant. 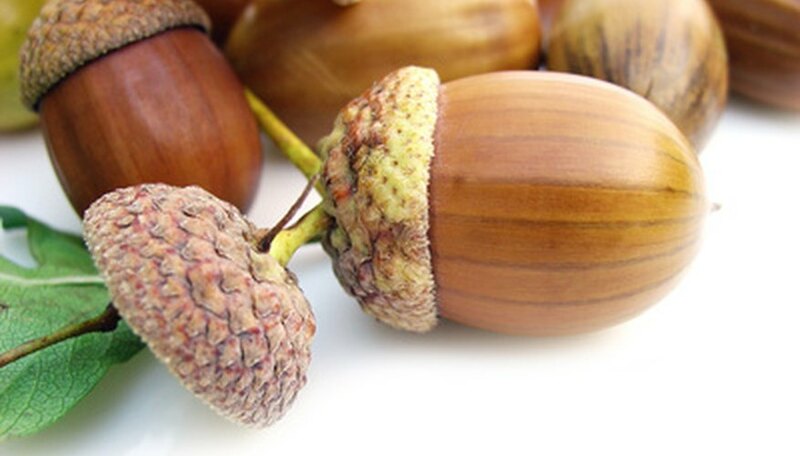 While removing caps, examine the acorns to make sure they have no holes or cracks in them, which can be a sign of insect damage. Test the acorns by putting them in a jar of refrigerated water for 24 hours. If they sink to the bottom, they are mature, viable seed. If they remain floating on top of the water, they are hollow and will not produce a seedling. Remove the viable acorns from the water, and plant them as soon as possible. Getting acorns in the ground early gives them a period of cold stratification, which is needed for them to germinate in the spring. If you do not wish to plant the acorn immediately, or you live in a harsh winter climate, you can imitate stratification in your home. If you wish to plant right away, jump to Step 6. Place the acorns on a paper towel so their outer shell can dry. You do not want the whole acorns to be too dry, as they will need a little moisture during their stratification period. Place the acorns in a plastic baggie and store in the refrigerator until you wish to plant them. Make sure the acorns have some, but not too much, moisture during storage. The best way to do this is to put a piece of damp peat moss or vermiculite in the baggie with them. Leave the acorns in cold storage for at least three months. Start your seedlings in an area that will be protected from deer, moles and other acorn-loving pests. You can start the seedlings as a group, and then transplant them to their final growing location later. Prepare the seedling bed by loosening the soil up to 6 inches deep. Plant the acorns in the soil at a depth of three times their size. If the acorn is an inch long, you will want to plant it 3 inches beneath the soil. Plant the acorns at lease 12 inches apart, and pat the soil down securely over the acorns, and then water well. Transplant your seedlings in the spring in their final growing location. When transplanting, dig a hole that is 1 foot deep and 2 feet wide. Fill dirt back into the hole, and plant the sapling at a depth where the top of soil will be about an inch above the root line. Add compost if desired, and tap the soil down firmly around the roots of the sapling. Water well, and keep an eye on the moisture content of the soil around the sapling until it gets established. You may have to water it every two days, especially if your area is experiencing a dry spell. You can also start seedlings indoors. Plant up to four acorns in a pot that is 12 inches wide by 12 inches deep. Acorns should be planted 3 inches deep into the soil, which should be half potting soil and half soil from your yard. Keep moist, and transplant seedlings outside in spring. Acorns can remain in cold storage for up to two years, as long as they do not dry out. Too much moisture during stratification can cause the acorns to become moldy and rot.